Have you ever gotten lost? Or have you spent more time looking for your maps rather than aiming for a catch? With GPS technology, this seldom happens anymore. BackCountry Navigator PRO is any man's Android GPS app, with Arizona BLM maps as an add-on purchase. From deer hunting on wildlife areas, to elk trailcamming on BLM land, to hiking in the mountains, Arizona BLM maps provides safety and accuracy in any outdoor adventure you chose. The Bureau of Land Management in Arizona recognizes the importance of recreation and quality of outdoor experiences. These factors affect the national and local economies, as well as the social enjoyment of their tourists or visitors. The capital and largest city of Arizona is Phoenix. The second largest city is Tucson. Arizona is one of the Four Corners states, which borders New Mexico, Utah and Nevada. It is known for its Grand Canyon, London Bridge, Hoover Dam, Meteor Crater, Painted Desert and Prickly Pear Cactus Jelly. Fossil resources on public lands In Arizona are a constant source of fascination for tourists. People look to these resources as recreational opportunities in fulfilling their curiosity about the recent and remote past, for contemplating their origins or preserving and continuing their culture and for finding peace and quiet in its desert landscape. BLM Arizona administers 12.2 million surface acres of public lands, along with another 17.5 million subsurface acres within the state. Field Offices throughout the state provide on-the-ground field management: Arizona Strip, Hassayampa, Kingman, Lake Havasu, Lower Sonoran, Safford, Tucson and Yuma. 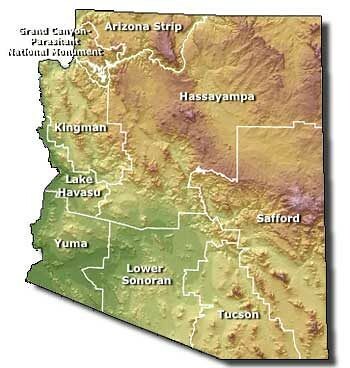 These vast acres of lands are included in the BLM Maps of Arizona for Android. Arizona BLM manages some of the most important and best-preserved prehistoric and historic archaeological sites in the American Southwest. These sites span the entire range of human occupation in the New World, from 13,000 years ago to the present. Android BLM Maps for Arizona has the complete details of these places. They include properties as diverse as Paleo-Indian mammoth kill sites, Archaic hunting camps, giant ground figures (intaglios), pueblo ruins, rock art, ghost towns, historic ranches, and numerous historic trails and wagon roads such as the Butterfield Overland Stage route. Arizona is one of the most famous and intriguing places in the southwestern region of the United States. This video is for everyone, for his or her trip preparation to Arizona with BackCountry Navigator PRO. Do not forget to bring Arizona BLM maps with you. Happy adventures! California BLM maps for Android distinguishes between public and private lands and these maps are now available as an add-on purchase to BackCountry Navigator PRO. BackCountry Navigator is one of the best Android GPS travel apps. These maps can be purchased by going to "Purchasing Add-ons" in the menu. According to Wikipedia, "Most state and federally managed public lands are open for recreational use. Recreation opportunities depend on the managing agency and run the gamut from the free-for-all, undeveloped wide open spaces of BLM lands to the highly developed and controlled national and state parks." BLM manages 15.2 million acres of public lands in California – nearly 15% of the state's land area – and 1.6 million acres in northwestern Nevada. BLM California also administers 47 million acres of subsurface mineral estate underlying federal surface land, 2.5 million acres underlying privately owned land, and 592,000 acres of Native American tribal land where BLM has trust responsibility for mineral operations. 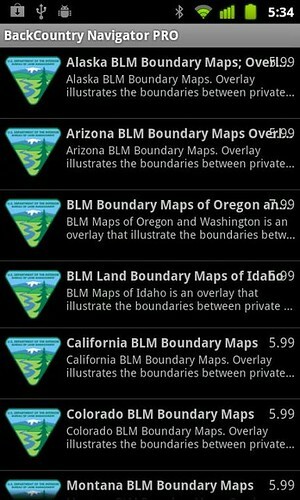 California BLM maps for Android is included in the 12 Western states which shows the boundaries of federal, state and private lands using the BackCountry Navigator Add-on maps. There are Top 10 Points of Interest in California through these field offices. Knowing the boundaries of public and private lands saves an outdoor lover the risk of trespassing into a private property and being open to the discretion of the private property owner, the worst is being shot. With this vast land area, rich with outdoor recreations that anyone can imagine, with legends that history brings, a customized California BLM maps for Android is a simple yet very important tool to complement an outdoor trip. It is the easiest way to access the whole state in the palm of your hands with a mapping app that can function even without network coverage as long as the map is downloaded before you leave and explore. Offline navigation is one of BackCountry Navigator PRO's greatest strengths and it has never failed its smart users. 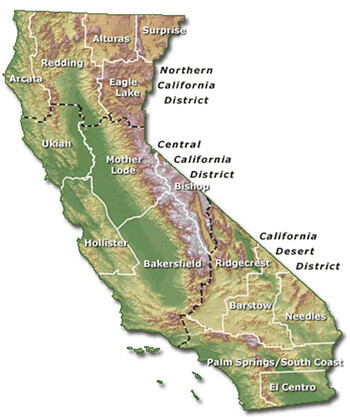 California is the only US state, which is written in history for the Goldrush in 1848. Here's to the story. No matter what time of year you visit, there is always something to do in Colorado – from hiking and biking in the summer to snowmobiling and skiing in the winter. 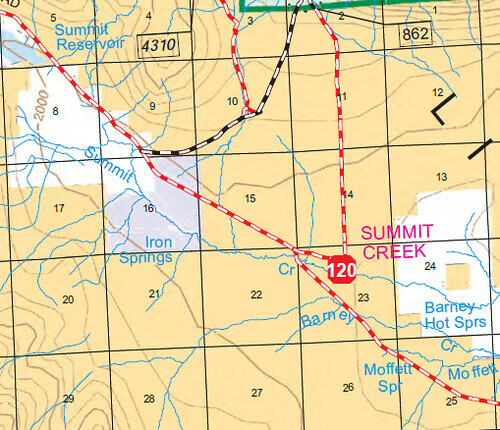 There is also a constant need for Colorado BLM maps to safely guide you between public and private lands. Being shot while hiking in a private land will surely ruin your planned discovery of the historic state. 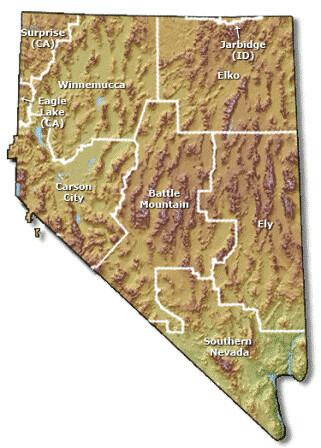 You will need BackCountry Navigator PRO Add-on map as one of your tools in your trips in BLM mapped lands in 12 US states. Colorado's 8.3 million acres of BLM public lands, along with 27 million acres of mineral estates, are concentrated primarily in the Western portion of the state. The lands range from alpine tundra, colorful canyons and mesas in the Southwest, to rolling sage-covered hills in the Northwest. These public lands contribute to Colorado's quality of life. BLM lands are often thought of as being America's playground and treasure. Public lands in Colorado are no exception. In Colorado, people rely on the Colorado BLM maps land for many uses such as recreation, cultural or historical tourism, and traditional uses like livestock grazing and mining. Whether it is for the solitude of a historic trail or for the benefits of energy development, people in Colorado and visitors to the state are not only looking to the public lands but for more – for something rare that only in unique Colorado can be found. Heritage tourists traveling to experience the places, artifacts and activities reflecting the stories and people of the past and present has become one of the fastest growing tourism segments in Colorado, growing at twice the rate of other tourism segments. To regulate recreation and tourism activities in Colorado, Colorado BLM maps was included in their planning efforts which resulted in Recreation and Visitor Services Strategy or the Colorado Recreation Program. It's purpose is to inform everyone of BLM's framework regarding the state of Colorado's public land. This is the complete copy of the program. 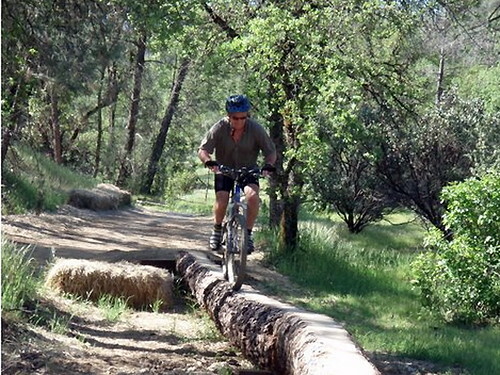 Special Recreation Permits (SRP) is required for a variety of recreation activities on BLM public lands. These permits are used to ensure public safety and protection, public health, natural resources and ensure that the public receives a fair monetary return for their recreation uses of BLM public lands. SRP's are required for commercial activities, competitive events and certain organized group activities in some designated special areas. Complete guide to supplement the use of Colorado BLM land maps can be found here. Colorado is a majestic place. 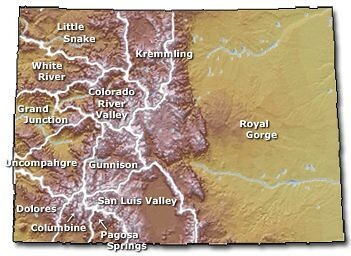 Good luck exploring and we’ll see you on the trail with Colorado add-on land maps from BackCountry Navigator. 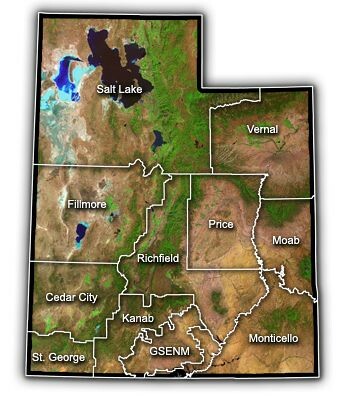 Idaho BLM Maps for Android are now available. This is an add-on available for purchase from BackCountry Navigator PRO. 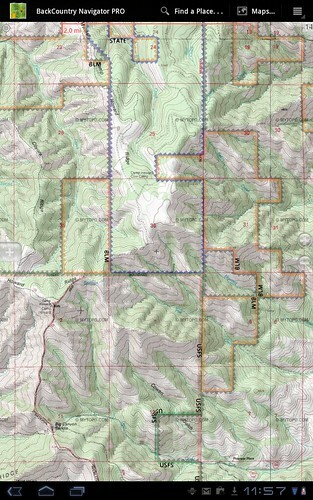 This will show boundaries of public and private land as an overlay on any topo maps you download for backcountry use. Idaho, nicknamed the Gem State because nearly every known gemstone can be found there, is the 43rd state in the Northwestern United States. It is the 14th largest state by land area, entirely enclosed by land with coastlines lying on closed seas. Idaho is a landlocked country. Amazingly, Idaho is one of the two places in the world where star garnets can be found. 6-ray Idaho star garnets from Emerald Creek are the most valuable and best quality star garnets ever known. Its most popular crop is potato, which also earned it the name Potato State. Recreating on public land in Idaho means fishing, backpacking through primitive canyons or mountains or paddling through excellent whitewater. Northwest Idaho is a haven of blue rapid flowing rivers and cascading waterfalls while Southwestern Idaho is a breathtaking mosaic of desert, rivers and mountains that has lured visitors for centuries. Eastern Idaho offers the beauty of snow-capped Teton Range, which appears as high rolling hills that convert smoothly into flat pasture. Everything about Idaho is a dramatic experience of stunning scenery and rarity. The Bureau of Land Management (BLM) manages nearly 12 million acres of public lands in Idaho, almost one-fourth of the state's total land area. BLM’s job is to maintain the health, diversity and productivity of the public lands so that future generations can also have the chance to enjoy it. BLM regulates outdoor activities by defining which is public land and private land through BLM maps. This land management gives direction to hunters to stay within areas of public land where hunting is allowed and avoid disputes from private property owners. The same regulation serves people who come to Idaho for camping, hiking, boating, hang gliding, shooting, off-road vehicle driving and mountain biking, birding and visiting natural and cultural heritage sites. Based on BLM maps, people will know if they are walking on private land or public land and avoid violation of BLM regulations. Hunting and fishing is legal in Idaho public lands as long as you hold a valid State license. Collecting natural materials on BLM public lands is also allowed except in developed recreation sites and areas where it has been prohibited and posted. – Commonly available renewable resources such as flowers, berries, nuts, seeds, cones, and leaves. – Nonrenewable resources such as rocks, mineral specimens, common invertebrate fossils, and semi-precious gemstones. – Forest products for use in campfires on public lands. BackCountry Navigator Android GPS app has a BLM map available for Idaho. Since the development of GPS devices, digital mapping has become more popular than the use of actual paper maps. Android GPS maps are most convenient and with the help of BackCountry Navigator, mapping of places for outdoor adventures is now easy, convenient, safe and precise. For a full list of abbreviations, please follow this link.